Leprechaun Pirates - Arrrgh Begorah! Gold Dabloons!! The pirates be seeking new Adventures this weekend, Arrrgh Begorah! The sweet trade calls to us in stories and songs, the sound of the rushing wind and the sight of land upon the horizon promise a full belly and a full treasure chest. Land Ho! It be time to go to shore and trade some songs for pieces of eight. It’s what every Leprechaun Pirate dreams of, sweet fine dreams of gold and jewels. my spirit wanted to sail free. Being a musician on a pirate ship is an essential job, so is keeping up the morale of the crew between prizes. It can also be a bit of a chore, as any crew member can request a tune, and even roust the musician out of bed. So in some ways we are the hardest working members of a pirate ship. Still, it’s a job that needs doing, and it’s better than swabbing the deck. We can also pick up a little honest money when we go to shore at the local tavern or even street corner. Everyone loves a good tune and adventure on the high seas. 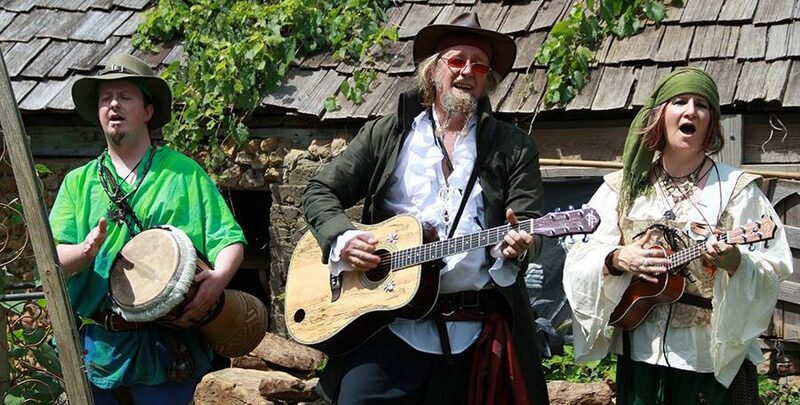 The Leprechaun Pirates will again be going on shore leave, this time for three full days of fun and frolic and pirates are especially welcome at the Minnesota Renaissance Festival on September 3, 4 & 5 • Passport to Adventure! So put on your favorite pirate gear and join us for a weekend of fun and feasting. Gather your crew for your next adventure by spreading the word, just click on a gold doubloon below Arrrgh Begorah! Coming soon to a Pagan Festival near you! Sacred Harvest Festival 2016 “Dreams and Bones”– Runs from Monday August 1st to Sunday August 7th. Sacred Harvest Festival has welcomed well over a thousand unique individuals who have made our tribe flourish. Pagans and nature worshipers and their children and elders come together once again for a week of joy, fellowship, and learning. We drum and dance into the night, create enriching rituals, and bask in our famous tribal community. This year we are free to bring our visions of the future, and bury the bones of the past. Our ancestors are watching and helping us! On a more personal note, me and my hubby the Cabin Boy are very happy to be going back to Sacred Harvest Festival this year. Last year, I played my ukulele in our tent during the rain to rave reviews. This encouraged me to keep up my ukulele practice a bit more. We both fell in love with SHF, and the new location at Atchingtan. Good fortune smiled, the Leprechaun Gods be praised, and we are thrilled to be going back. I will perform with my fellow Leprechaun Pirates on the stage on Saturday night August 6th. We plan on going up early, to partake of some of the best of Sacred Harvest Festival. There is nothing like falling asleep to drumming around a campfire. If you’ve never done it, now is the time! Check out their web page for all the other fabulous guests, other events, camping information, registration options and more! You can also connect with others on the official Facebook Event. So come and join the fun! We’ll see you at the festival.